Arrrrrgggghhh, do you ever get that thing, where you remember doing something, like you actually have memories of completing it and then you find out some time later that it never happened and you still haven't done it? Just me, ok! Well, that's what happened with the Whovian Indie Box. I honestly remembered putting it on the blog before I hermitted away for a week and a half with pain, only to realise when I went to get back to doing stuff, that it absolutely never happened. So I am finally getting it up on the blog today. It's photo heavy so I hope you're ready. 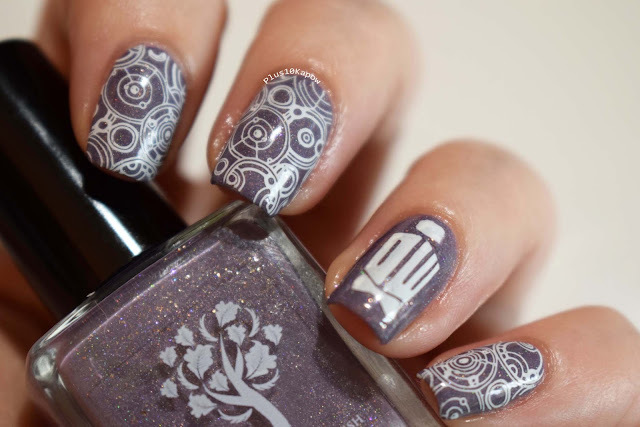 The lovely Lea aka LeasNails has recently revealed Sparklea Nail Polish (formerly Charming Tale), which is opening soon and one of her first releases was this gorgeous rose gold polish called Bad Wolf Bay for the Whovian Indie Box. 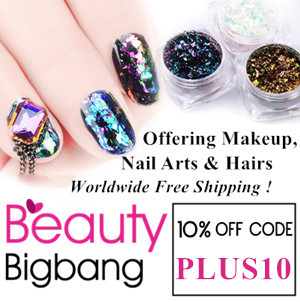 It has a fantastic formula and applied beautifully. It dries fast and look at that gorgeous shimmer. This is 2 coats with topcoat. 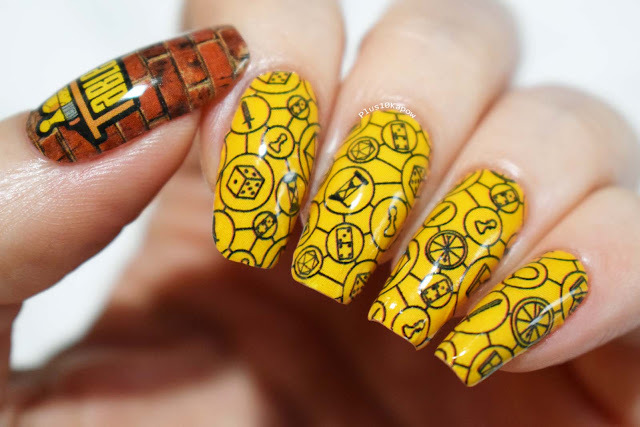 Now if you are looking at this an wondering 'what do wings have to do with Doctor Who? ', the answer is nothing my dear, because it's not wings, it was in fact my attempt at doing a crack in space and time but it didn't look quite as I hoped when I had finished. These 3D glasses are awesome though. 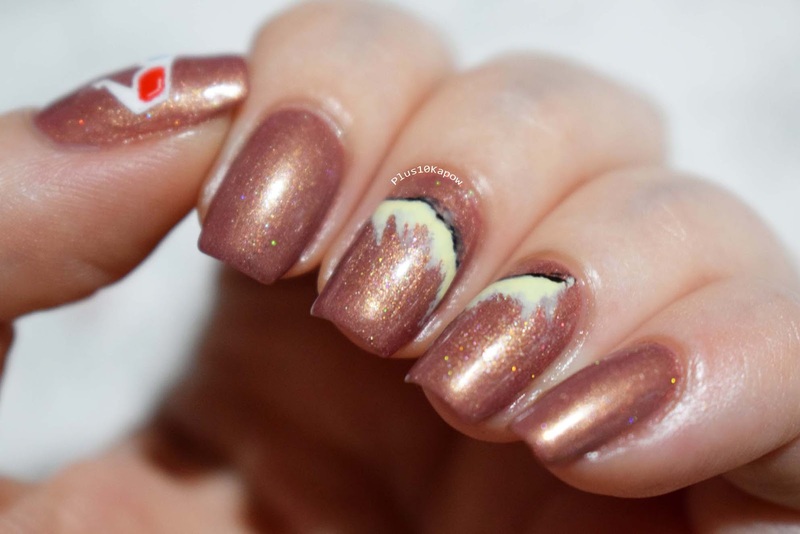 Freckles Polish- Would You Like a Jelly Baby? Would You Like a Jelly Baby? 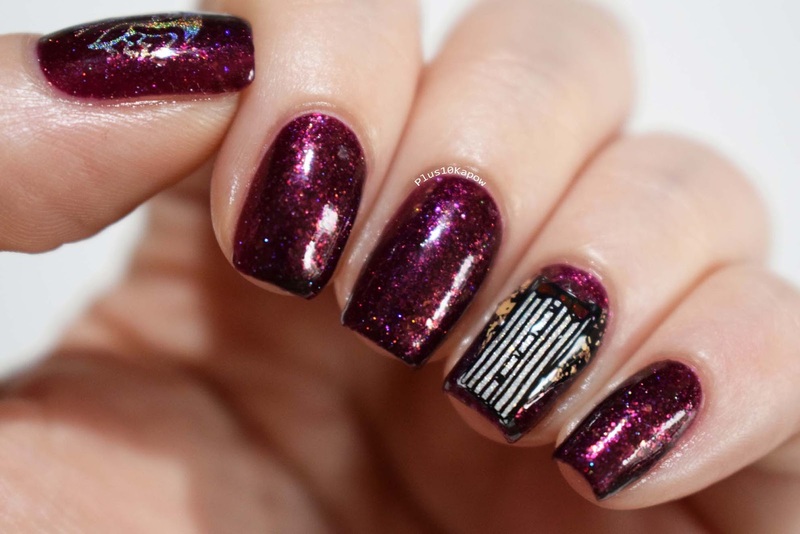 is a lush purpley red jelly, packed with holo glitters and golden flakes. The formula is fantastic, it really did apply lovely and was opaque in 2 thin coats and is smooth as can be with 1 coat of topcoat. This is supposed to be the jacket of the Eleventh Doctor, I used a glitter polish to try to emulate the tweed jacket he wear, you can't really see the lapels properly though, but it look fab in real life. 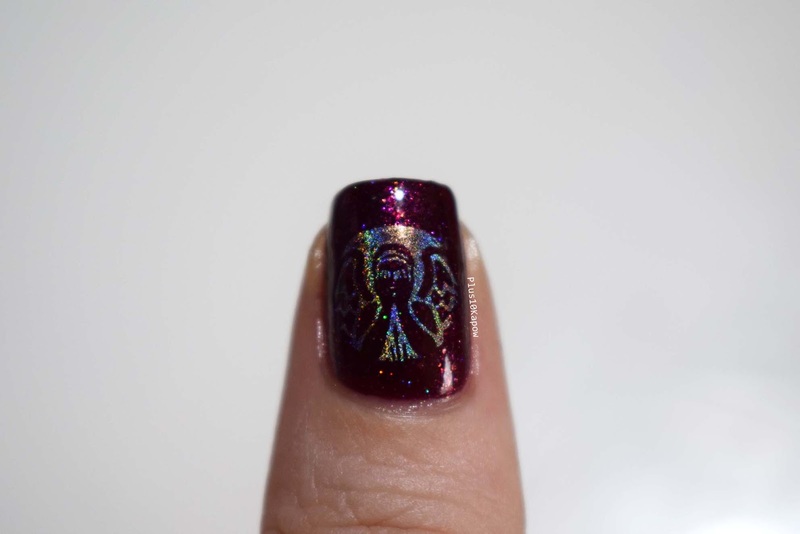 I also added this beautiful Weeping Angel stamp to the thumb in holo. Oh my, Galifrey Lost is an absolutely beautiful mauve with scattered holo and I am in love with it. 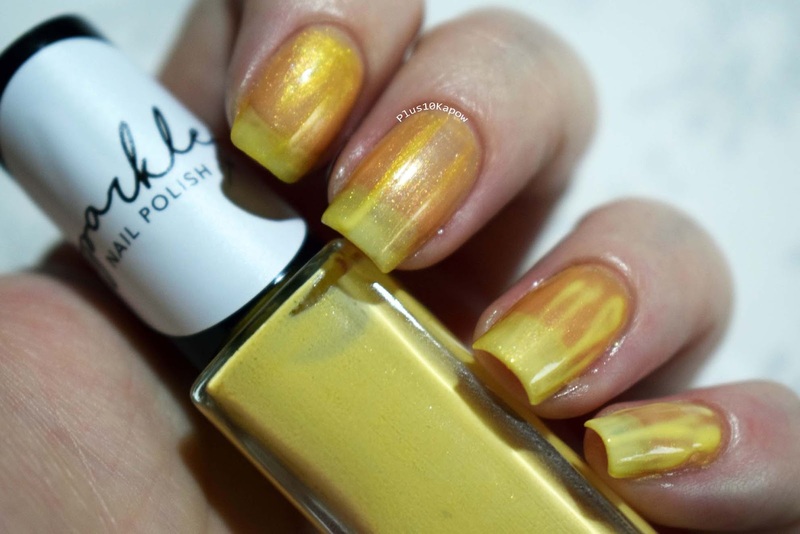 It applies nicely, and dried quickly and you could get away with one thick coat of this one. This is 2 coats with topcoat. 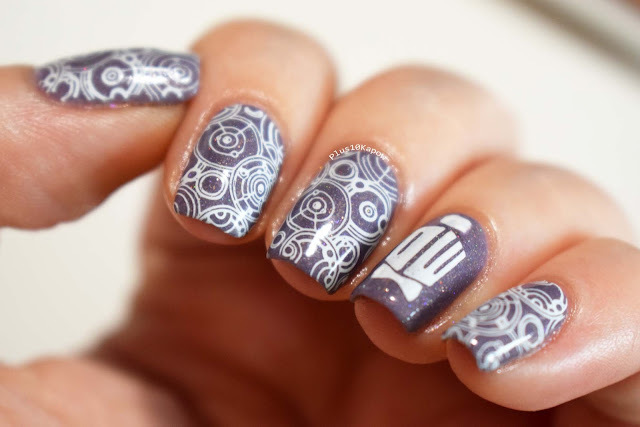 I added nail art to this but I just basically pinched the idea from my Doctor Who nails from a while ago. 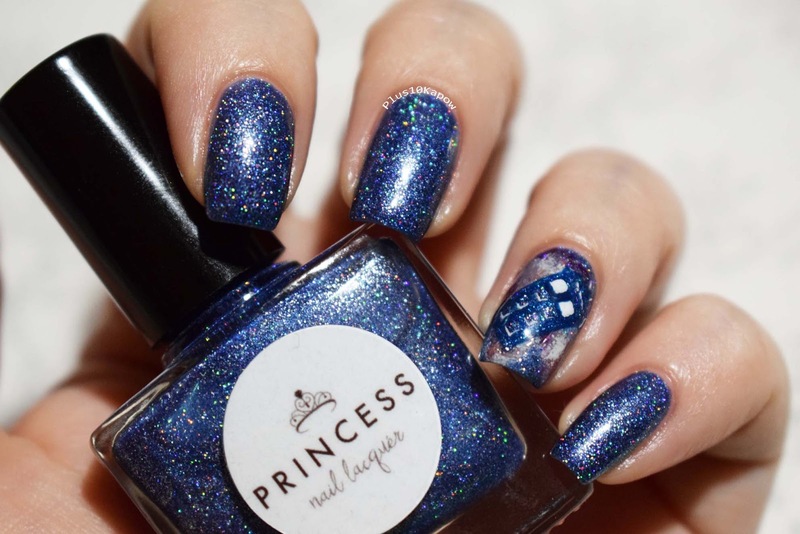 I thought the Galifreyan design was perfect for this polish. I love the sparkles peeking through. 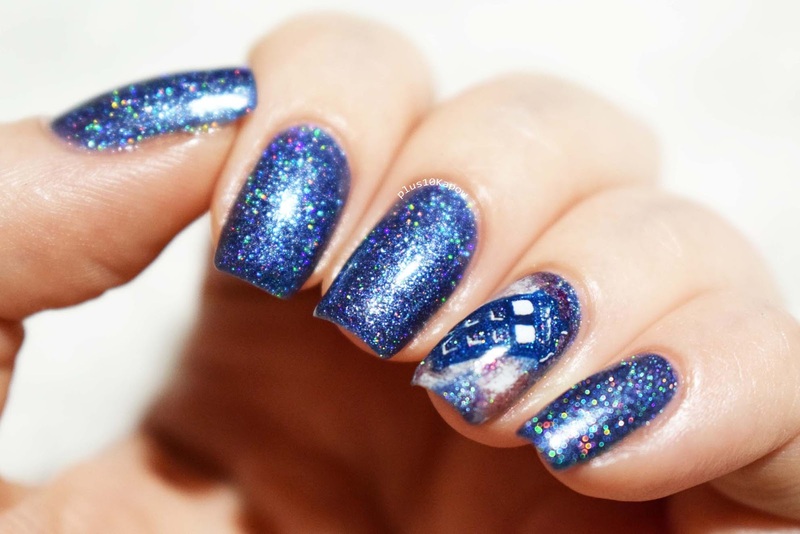 Bigger on the Inside is a lush, sparkly, Tardis Blue and could hypnotise anyone into doing anything you want, probably. Like the rest, the formula was perfection and it gave complete coverage in 2 coats but could also work as one coat over a nice blue or even black. 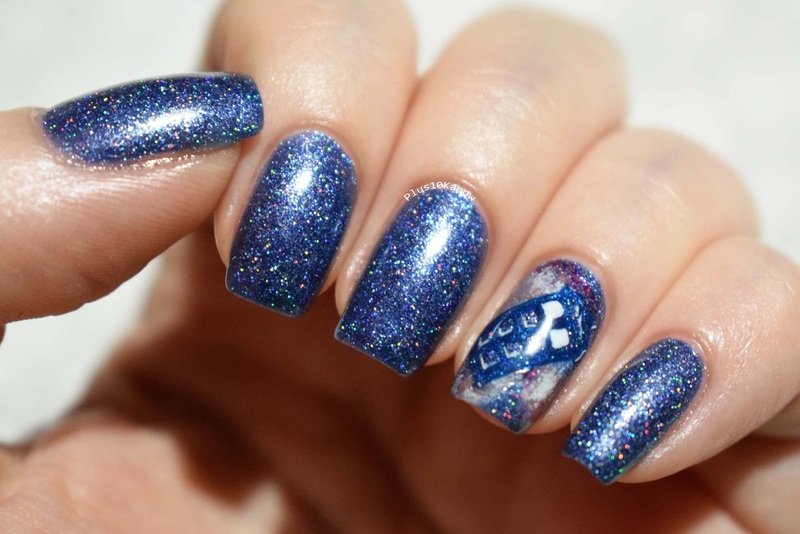 The sparkles make it very versatile. 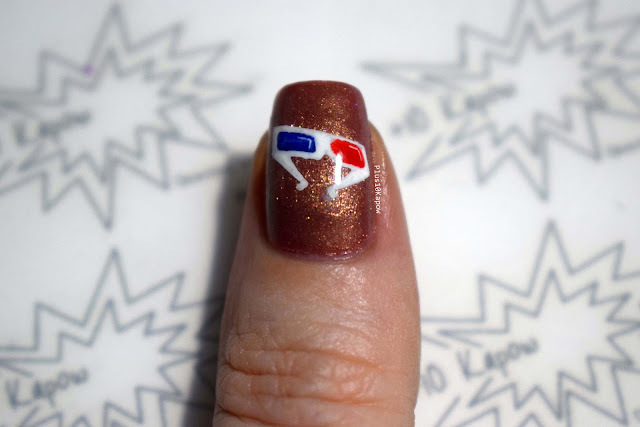 This one dried a teensy bit gritty because of the glitters but that was easily solved with 1 coat of topcoat. This peel off from Sparklea is yellow in the bottle but dries to a shimmery gold and let me tell you, it's pretty hard to get up the motivation to peel away something this pretty but it gives good peel! 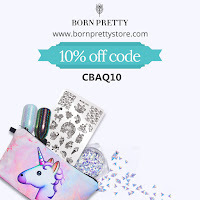 It was so easy to use and so easy to peel off in one piece and it didn't leave behind any greasy residue. 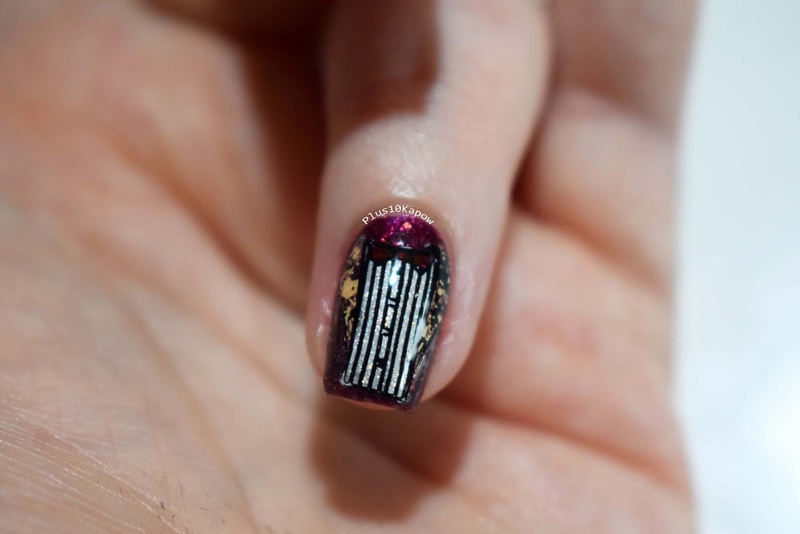 It can also be used as a peel off base coat although only really on darker colours because the gold is quite bold and will show through. 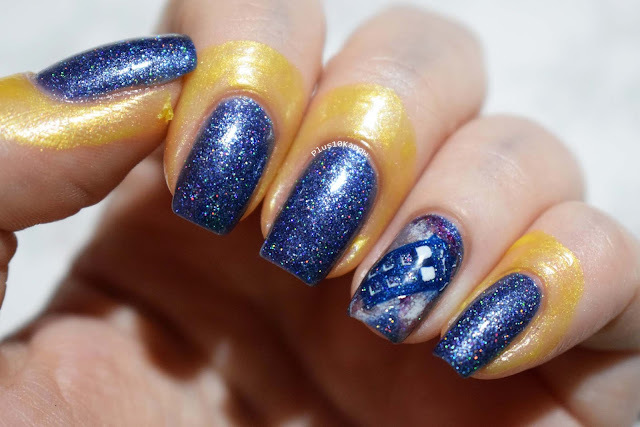 I then used all the polishes from the box to do a galaxy mani over Bigger on the Inside and although it went quite far from my vision, I kinda really love it. 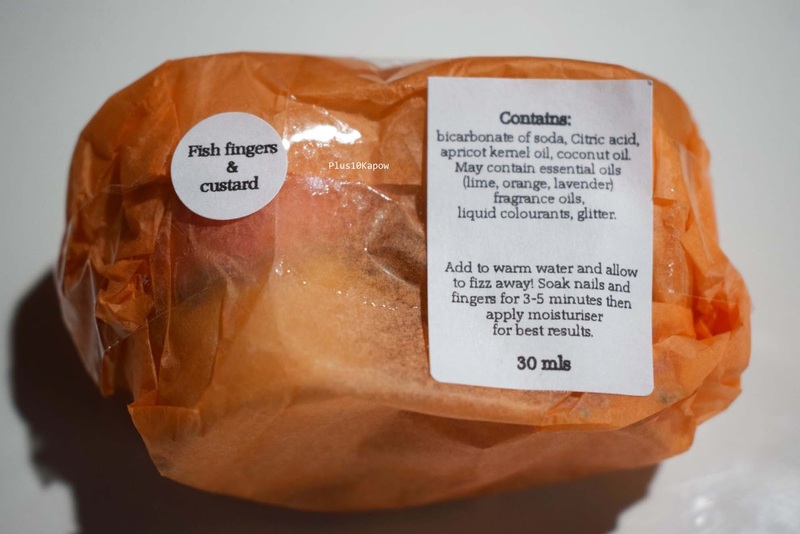 Also included in the box were 2 Fish Fingers & Custard (which sounds delightful) mani bombs from Danglefoot Nail Polish. 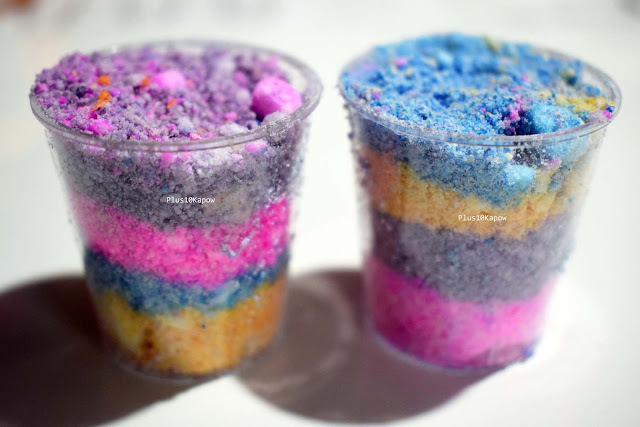 They were in little plastic shot glasses which I kept after I used them because they could come in handy for nail stuff. they smelled delicious, almost good enough to eat. 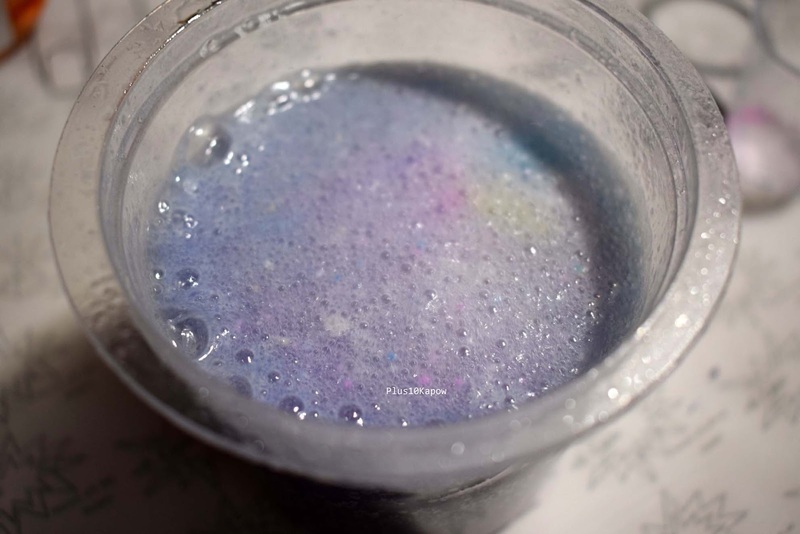 I took a fizzy photo so you could see how it looked when it was going, it then settled to a lovely deep blue finger bath and my hands and nails felt amazing after using them. the sweety smell hung around for ages which was lush but I very nearly ate a finger, so it's fairly dangerous, you've been warned. 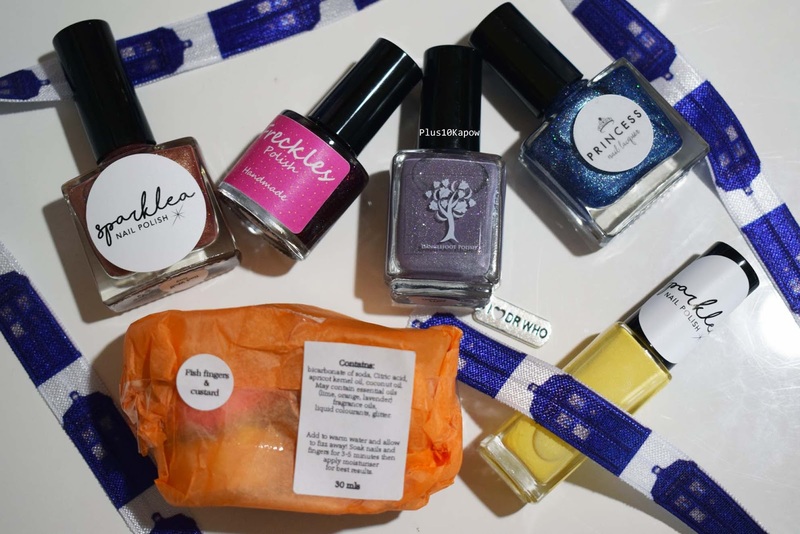 Once again, this was an amazing box put together by Hayley (Danglefoot Nail Polish) and I adore all the polishes. 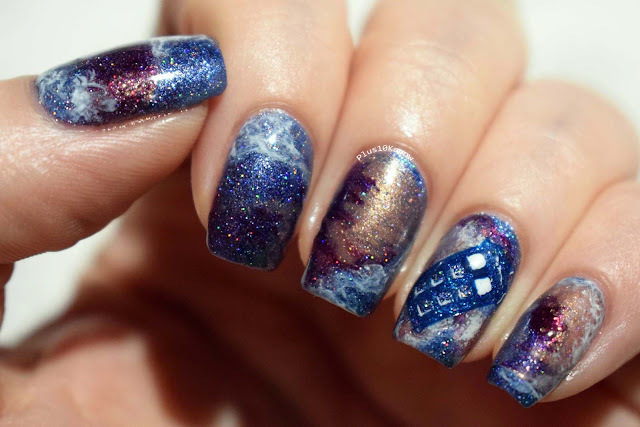 As you may know, I'm not really into Doctor Who, I know a few things but not much so I am hoping that I did the Doctor proud with these mani's, even though I put the wrong Doctor on Would you like a Jelly Baby? Kicking myself that I didn't do a scarf instead. I will definitely be buying the next one, if there is one and whatever the theme is. What did you think of it?